Golden State Laundry Systems is proud to help California store owners build profitable laundromats, and one of the best things you can do to get the most from your space is to install stack dryers from Wascomat and Electrolux. Why Should Laundromat’s Buy Stacked Dryers? Stack dryers help you get more productivity per square inch of floor space in your laundromat. In smaller laundromats, with space at a premium, the benefits of stack dryers are obvious. But even in large stores, stack dryers carry significant advantages for store owners. A wall of brand new Electrolux or Wascomat stack dryers look great and will help first-time customers choose your store. And at peak times stack dryers will turn your laundromat into a profit-building powerhouse. With no dryer bottlenecks and more space available for your profitable high capacity washers, you’ll be glad you chose stack dryers from Golden State Laundry Systems. Bring the brand recognition and industry-leading technology of Electrolux to your laundromat with Electrolux Professional stack dryers. Choose between the Electrolux T5300S dryer (2x35lb) and the Electrolux T5425S dryer (2x50lb). Up to 25% energy savings from Axial Airflow, Tight Construction, and Reversing Cylinders. Up to 15% extra energy savings with Eco Power. Dual language display available with Compass Pro microprocessor — a huge plus for stores in multilingual neighborhoods. To get the best results from your Electrolux stack dryer, choose from our large range of Electrolux Professional washing machines. For the absolute best results choose one of our high G-force models. These washers extract so much water in the spin cycle that many store owners are able to offer a “free dry” when customers use these washers. 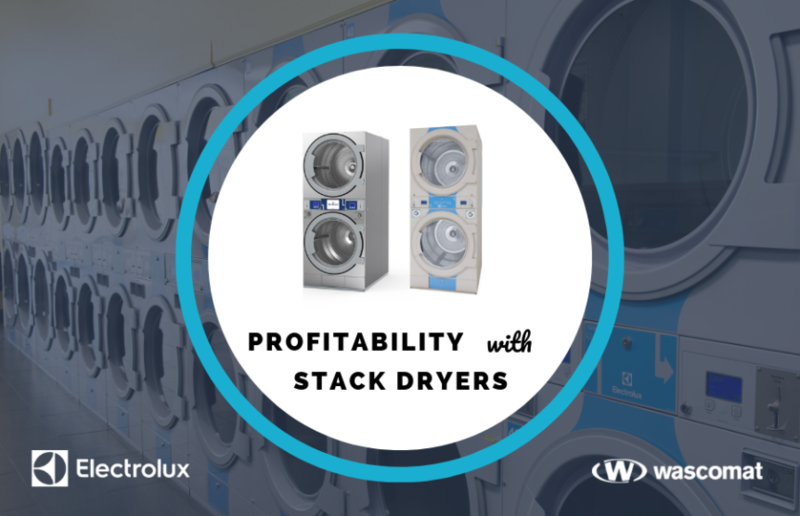 With famous reliability and a brand new modern stainless steel design, Wascomat stack dryers will deliver energy savings while providing excellent results to your customers and transforming the look of your store. Choose between the Wascomat D735S dryer (2x35lb) and the Wascomat D750S dryer (50x50lb). Incredible energy savings from Axial Airflow, Tight Construction, Reversing Cylinders, and Eco Power. Brand new stainless steel design. Available with LaundryPay— the smartphone app that lets customers pay with their smartphone, check machine availability, and even earn reward points. Our Wascomat dryers are designed to work together with Wascomat Commercial washers as a complete laundry system. The high-volume water extraction in our washers helps your laundromat cut dry times — more convenience for your customers, more savings for your business. Are you ready to order your stack dryer? Don’t delay! Golden State Laundry Systems is offering free freight on all Electrolux and Wascomat coin stack dryer orders until January 31. Contact us today! Looking For Business Opportunities for 2019? Open A California Laundromat!